When I lived in Houston, I took my proximity to New Orleans for granted. It was just another city that my parents and I would drive to for occasional weekend trips. Being a typical high schooler, I'd be bored on the drive to Louisiana, whining about my parents' choice of classical music for the five hour ride. That was just the beginning because still, they dragged me along (kicking and screaming) on historical tours in the French Quarter and the Garden District. My complaints about the brutal humidity, hot weather, and the trip as a whole could only placated by beignets from Cafe Du Monde. These days, I certainly regret not paying more attention during those weekend trips. In the last few years, New Orleans has blown up and become the next cool city to move to amongst my peer group (first it was Portland, followed by Oakland and/or Brooklyn). I can see why — the rent is certainly cheaper than anything you can find along the coast, and who's going to deny New Orleans's food/drinks/party scene? Because of course, at the heart of New Orleans's party scene is Mardi Gras. 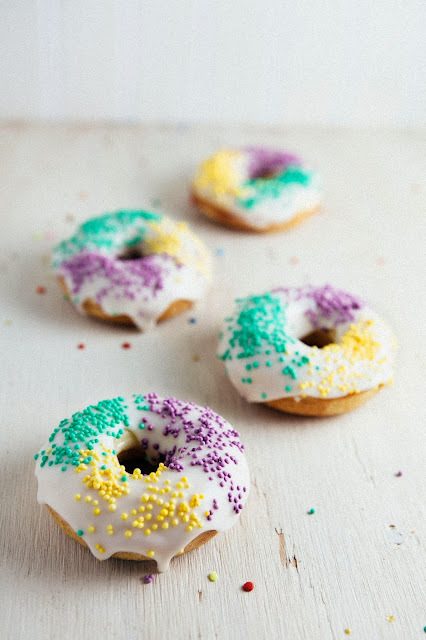 Mardi Gras, French for Fat Tuesday, refers to the practice of eating indulgent and gluttonous foods on Tuesday before the upcoming Lent (which begins the following day on Ash Wednesday). New Orleans takes that day and extends it to a whole week filled with festivals and parades. 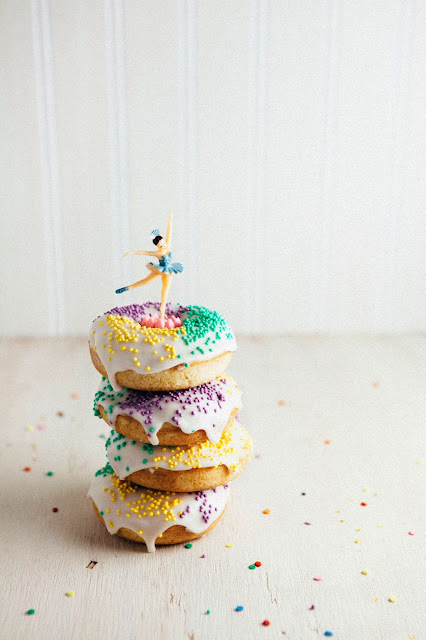 Back in Houston, I was pretty attuned to these dates — they were hard to miss as kids from my high school would always bunk off a few days from school to secretly drive up to New Orleans and attend the city's epic festivities, and there would be King Cakes everywhere. But since then, none of the cities I've lived in have celebrate the event (I mean, Erlend, who is East Coast born-and-bred, had no idea what Mardi Gras even was). It was only when an old high school friend idly asked if I had any celebration plans that I'd remembered the holiday existed in the first place. Instantly, I was transported back to my past, and became nostalgic for the weekend trips with my parents that I used to hate so much. Funny how that happens. You can probably figure out the next problem from there. The ballerina couldn't exactly fit into a donut. And so my hidden trinket became a cake topper instead. Oh well. It's the spirit that counts, right? As they say in New Orleans, laisserz les bons temps rouler. Let the good times roll. Happy Mardi Gras, everybody! 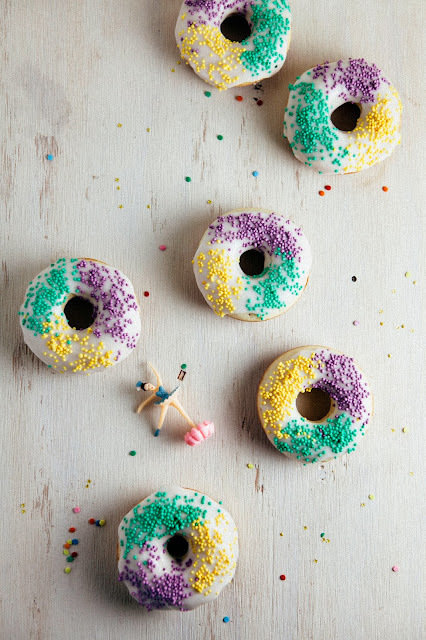 King Cake is usually topped with the Mardi Gras colors of green, yellow, and purple. Traditional King Cake uses sanding sugar, but I used nonpareil sprinkles instead. 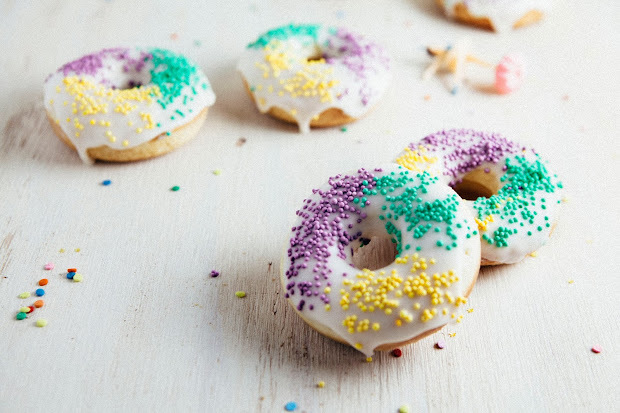 White nonpareils are available in the baking aisles of almost every major supermarket, and you can dye them with food coloring to get the green, yellow, and purple colors. Simply take however many nonpareils you want and shake them in a Ziploc bag with a couple drops of food coloring. Watch the sprinkles magically turn colors right in front of you! Leave the bag open and let dry for about an hour before using. The dough for these donuts are based on a Finnish sweet dough recipe from Lara Ferroni's Doughnuts cookbook. They are yeasted, but baked in the oven instead of fried like a traditional donut. They are best on the day they are made as they tend to get chewy and dense overnight. In the bowl of a freestanding electric mixer fitted with a paddle attachment, combine 1 large egg and 1/4 cup granulated sugar. Beat on medium speed until well combined, about 1 minute. As you beat the sugar and egg, briefly whisk together 1 cup whole milk (warned to 115 (F)), 1 tablespoon active dry yeast, 1 teaspoon vanilla extract and 1 teaspoon salt, before adding it to the egg and sugar on low speed. In a separate bowl, whisk together 2 cups all purpose flour and 1 tablespoon ground cinnamon. Add to the mixture at low speed, about 1/2 cup at a time, and beat until the dough is thick and pulls away from the side of the bowl. Once the dough is thick and pulls away from the bowl, stop the mixer and switch to the dough hook. Turn the mixer back on to medium speed and add 1/2 cup cubed unsalted butter one piece at a time. Continue beating until no large chunks of butter are left at the bottom of the bowl, around 3 to 5 minutes. 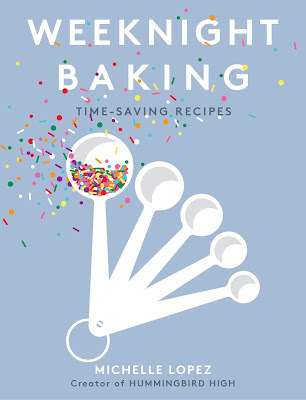 Reduce speed to low and add additional flour one cup at a time (up to 1 1/2 cups) until the dough gathers around the hook and cleans the sides of the bowl. The dough should be soft and moist, but not overly sticky. Turn the dough out onto a floured surface and knead gently until the dough no longer sticks to your hands. Transfer the kneaded dough to a lightly greased mixing bowl, turning the dough once over to lightly coat all of its surfaces. Cover with a damp tea towel and let rise in a warm spot until doubled in volume, about 1 hour. Once the dough has risen, preheat the oven to 400 (F). Punch down the dough on a lightly floured surface and roll out to 1/2 inch thick. With a 3 1/2-inch donut cutter, cut out donuts and stamp out the holes. Place donuts at least 1 inch apart on a baking sheet lined with parchment paper or a Silpat mat. Cover loosely with plastic wrap and let sit in a warm spot until the donuts have doubled in size, about 20 minutes. When the donuts have proofed again, bake the donuts for 5 to 8 minutes in the preheated oven. The donuts will be a light golden brown — be careful not to overbake them! Transfer to a wire rack to cool for 30 minutes before glazing and eating immediately. In a small bowl, use a rubber spatula to stir together 2 cups confectioner's sugar, 2 tablespoons whole milk, and 1 teaspoon vanilla extract until the sugar is completely dissolved and you are left with a liquid-paste like substance. Use immediately to glaze the donuts! If not, the glaze will harden and it'll be hard to glaze your donuts. The best way I found to glaze the donuts was to actually dunk the top half of each donut into the bowl containing the glaze. Once the top has been glazed, lay the unglazed part of the donut on top of a cooling rack with a plate underneath — this will allow excess glaze from the donut to drip onto the plate. 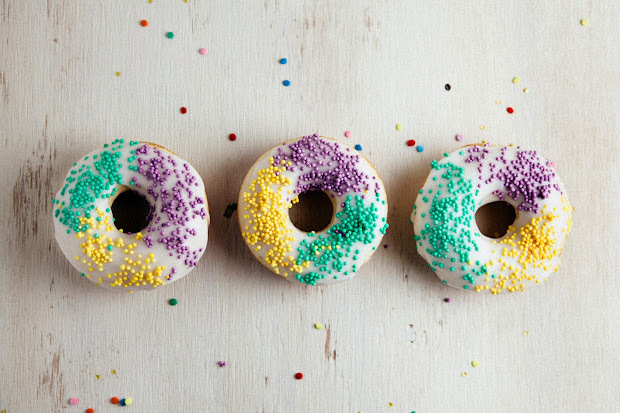 Sprinkle immediately with your Mardi Gras colored sprinkles. If you wait to decorate the donuts, the glaze will harden and the decorations will not stay on the glaze. I've been on the fence about making a King Cake today. Never made one and I'm short on time, but these I can do! Perfect size and the ballerina is perfection. 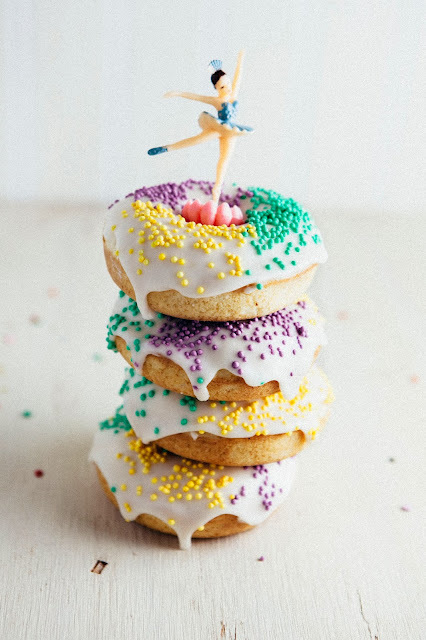 Over here we tend to celebrate Mardi Gras (or Shrove Tuesday as we call it) with pancakes but I think I should institute a new king cake donut tradition next year! seriously cannot get over how cute these are. and that ballerina!!! As always, your baked goods and your photography is mesmerizing. Really beautiful stuff.These doughnuts look incredible. I love your blog! Absolutely adore these little donuts! You've got to make it out here to New Orleans one year for Mardi Gras, you'll never regret it! No one really celebrates Mardi Gras out here in California either, but maybe I can use it as an excuse to whip up a batch of these??? By the way, lovely photography, as usual! very appropriate!! I went to NOLA last year for the night but didnt get to explore much..need a trip soon. As I was reading this, I realized how true it is that other parts of the country don't seem to be aware of Mardi Gras--over the past few years of being in Houston, king cakes have started to become the norm but I remember how intriguing they were at first (to a girl coming from California). DOUGHNUTS? You are brilliantttt. Fun! Love the sprinkles. Happy Mardi Gras. 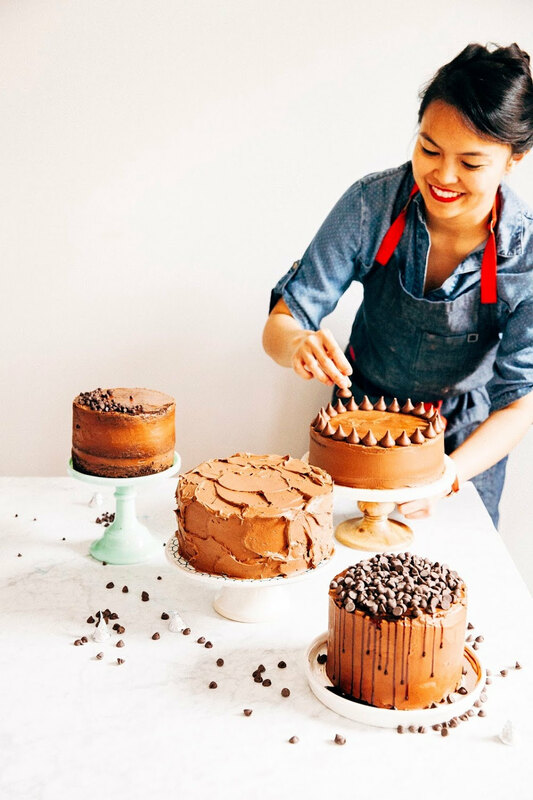 Great take on the traditional cake! Mardi Gras is a season, not just a week, usually lasting the month leading up to Fat Tuesday. Rex, King of Carnival, selected the official Mardi Gras colors in 1872 to honor the visiting Russian Grand Duke Alexis Alexandrovich Romanoff, whose house colors were purple, green and gold. The 1892 Rex Parade theme "Symbolism of Colors" affirmed the colors' meaning. Rex, then assigned meaning to them. Purple stands for justice, green for faith, and gold for power.